At NASA’s Goddard Space Flight Center in Greenbelt, Maryland, the James Webb Space Telescope team is in the process of installing the largest space telescope mirror the world has ever seen. Here, the primary mirror is made up of individual segments, and the team must control each segment separately to ensure perfect alignment when the composite process is completed. The mirror will fold up during launch, and when in space, it will unfold entirely, ultimately providing a broad spectrum of view. For the mirror segments to work in tandem with each other, they must be placed within few millimetres of each other. This requires impeccable accuracy and the scientists are using a robotic arm called the Primary Mirror Alignment and Integration Fixture for this purpose. This arm can move in six directions to manoeuvre over the telescope structure. One team of engineers controls the movements while another takes laser measurements to ensure placement of the mirror segments. On the telescope structure, the team has marked certain reference points. These Spherically Mounted Retroflectors convey to the scientists where the final mirror surface is located. To adjust the position if needed, a laser tracker measures precise distances in a customised coordinate system. Each of the mirrors is made of beryllium, an element reputed for being able to tolerate extremely low temperatures, which is a basic necessity in space. Added to that, a thin gold coating enables reflection of infrared light. 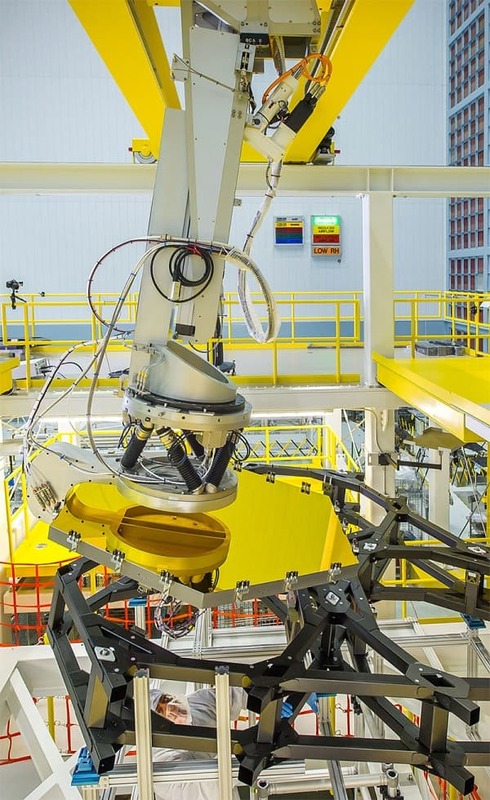 Harris Corporation is assisting this project by integrating components made by different subsidiaries to form the optical telescope element, the all-important portion of the telescope responsible in collecting light and providing “sharp elements of deep space”. The stakeholders of the James Webb, NASA, the European Space Agency and the Canadian Space Agency are eagerly waiting to get done with the telescope’s development process. Maybe they realise, being the successor of the Hubble comes with a lot of responsibility!